I just found out that Jet magazine will no longer publish in print. They are going to digital format only. I’m so happy I was able to pick up a copy of their final print issue. It was the last one at the store, and the store owner told me I was lucky, because they had been selling like mad! I can never remember a time when there wasn’t a Jet magazine, and it’s no wonder—I just read that the magazine started in the year I was born! I remember reading Jet as a child and as a young woman, back when it was one of the pitifully few places that reported information of major interest to the Black community. I got scared when I saw the legend “Final Printed Issue” on the cover. I thought at first they were going out of print altogether, i.e. out of business. I was so relieved to see that they will continue to publish, but just in digital format. As an author who is multi-published in both print and digital formats, I can understand this move by Jet. I had to be dragged kicking and screaming into the digital world, both as an author and as a reader, but now I’m so happy I was! I love my Kindle and go nowhere without it. For those who may not know, magazines and newspapers can be downloaded to a Kindle (or Nook, if that is your reader drug of choice) as well as books. You can also download personal documents as well, but I digress. 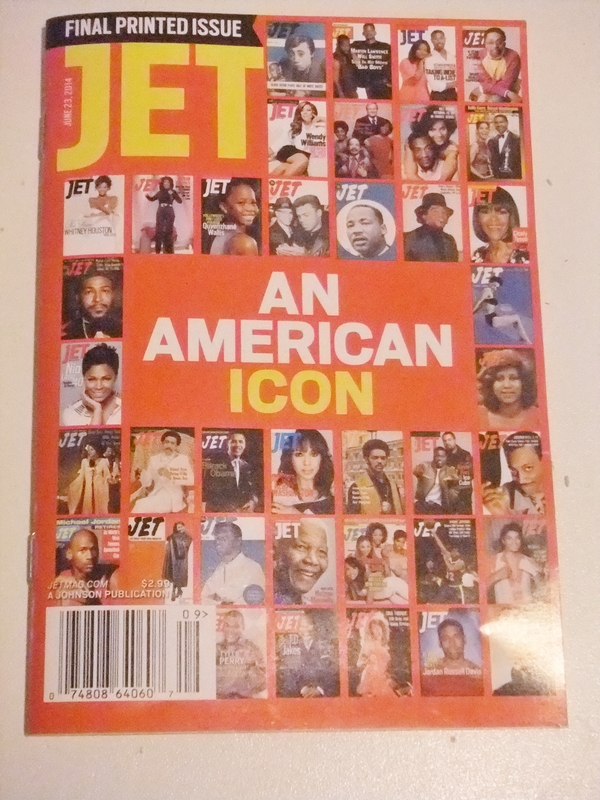 I’m looking forward to reading Jet digitally, and I thank them for being there for the Black community long before (virtually) anybody else was. This entry was posted in Black Culture (African American), Books- Writing and tagged African American, book, Jet Magazine, reading. Bookmark the permalink.